The city of Aswan in Upper Egypt is the center of this ancient culture that has given to the world the famous Nubian vault, built of adobes (sun-baked clay bricks). The Egyptian architect, Hassan Fathy, has disseminated this knowledge throughout the world through his famous book Architecture for the Poor, that for many has been a great intellectual and technical inspiration. 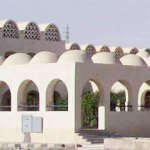 Great was the surprise of EcoSouth colleagues to see in Aswan an endless number of modern buildings covered with these characteristic vaults on schools, mosques, churches, shopping centers, office buildings, etc. The city of Aswan in Upper Egypt is the center of the ancient Nubian culture that has given the world the famous Nubian vault, built of adobes (sun-baked clay bricks) and without formwork or other mechanical supports. It is an interesting technique, where the bricks are laid in slightly inclined rows in the form of a centenary curve. The Egyptian architect Hassan Fathy has spread this knowledge throughout the world through his famous book Architecture for the Poor, a book that for many of us has been an intellectual and technical inspiration. Great was our surprise in Aswan to see an endless number of modern buildings covered with these characteristic vaults. Our tourist guide Mohamed organized a taxi and, together with Martin Melendez, we began a trip through the city, visiting schools, mosques, churches, shopping centers, office buildings, etc. 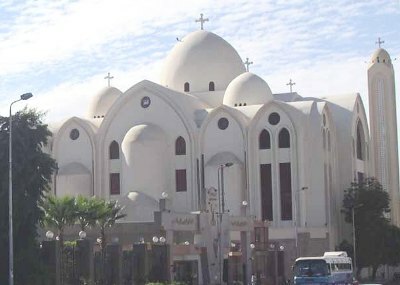 Mohamed explained that the wife of the Egyptian president, Suzanne Mubarak, has taken great interest in the conservation of the different national cultures and is encouraging that public buildings in this region include the traditional vaulted elements. Of course they are not adobe vaults, rather the great majority are of concrete or fired bricks, although in the rural area adobe vaults are still the norm. In various places outside the center we also saw sumptuous houses with vaults and domes, one being a residence of a famous Egyptian musician. But, everything is not the color of roses. New Gourna, the village near Luxor built by Fathy some seventy years ago has completely deteriorated. The government at that time had decided to move people who lived around the tombs of the pharaohs to another site, and the young architect Hassan Fathy built an architectural jewel in raw earth for them. But, who would move from a place with hidden treasures to a place that has nothing? Who would change from being a excavator of riches to being a poor farmer without land? The village never functioned and today is mainly deserted. However, the vision of Nubian vaults extended throughout the planet when Hassan Fathy published his experiences in the United States. In the 1970s as the appropriate technology boom was at its peak, Fathy became somewhat of a prophet of earth construction and animated many people to practice this art. Some readers of this Website may remember John Norton, who gave an excellent lecture about woodless construction at the second EcoMaterials Conference in Santa Clara in 2001. John was a disciple and colleague of Fathy. At the EcoMaterials Conference this year, there will be an associated seminar in Havana about earth construction (www.ecomateriales.ecosur.org).